Wet-Layup Protection with Nitrogen Blanketing is necessary and proven method to help protect and avoid corrosion of your boiler circuit with the South-Tek Systems N2-GEN LPS Series Nitrogen Generator Series. No more need to use tube trailers, costly demurrage charge, cylinder maintenance and storage. Make the Nitrogen for your application ANY TIME you need it and REDUCE COSTS. Real ROI that can be proven and deliver real savings to your annual maintenance budgets! Problems related with improper layup include general corrosion, which adds to elevated iron levels in boiler water, and pitting corrosion conducive to the cracking of pressure parts and waterside leaks. Inadequate layup also can force operators to extend startups to satisfy chemistry specifications. 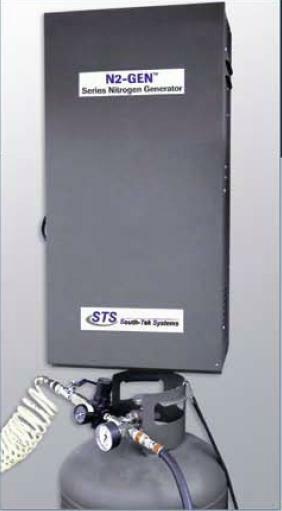 The Solution - South-Tek Systems – N2-GEN LPS Series Nitrogen Generator using state-of-the-art PSA technology . By converting compressed air readily available from plant supply our N2 Series delivers concentrated nitrogen output stream. With integrated PLC-based control system, we assure the plant of nitrogen having a purity 99.6% up to 99.999%. The N2 Series generator provides a nitrogen blanket capable of preventing oxygen ingress and for improving the overall cycle chemistry. EPRI recommends a minimum of 99.6% nitrogen purity for wet layup and can easily accomplished with our system. During periods of fuel-pipe inerting, the generator can easily be set to purge any pipe in the plant, eliminating the need for bulk nitrogen storage or cylinders. A quick connection to the nitrogen-generator outlet with a standard hose is used to reach any fuel-pipe tap necessary to inert the entire system prior to maintenance. The Result: The nitrogen generator has improved overall cycle chemistry by reducing iron deposition in the boiler and HRSG units caused by surface corrosion. An EPRI key initiative - Achieve optimum and key startup chemistry much faster following a nitrogen boiler layup. Reduced nitrogen bulk, storage, rental costs by utilizing onsite production. The potential for employee injuries associated with handling and maintenance of high pressure cylinders and additional storage space. South-Tek Systems specializes in the design and production of Nitrogen Gas Generators. Our products are manufactured in the USA We are pleased to assist you in design, technical specifications, and your system application. Our reputation is well known for excellent customer service, field engineering, 24/7 support and the highest quality designs to meet your specification requirements. Let our customer references provide you the assurance that South-Tek Systems is the leader – We are Nitrogen! South-Tek System's nitrogen generators can be used to produce nitrogen for the removal of contaminants through a process known as sparging. Also referred to as gas flushing, the process involves bubbling a gas through a liquid which helps helps remove contaminants thus protecting the integrity of products while reducing safety hazards. During the process, contaminants move toward the surface, with the gas, and are removed. 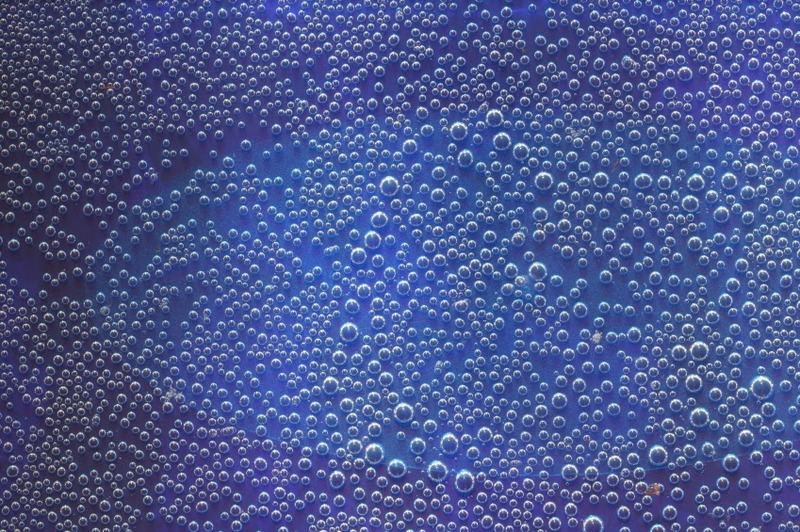 The food industry often uses nitrogen sparging to help remove atmospheric gases. Once removed, the inert atmosphere helps preserve food quality and increase product shelf life. Companies also utilize nitrogen sparging to meet pollution guidelines by removing volatile organic compounds. If your company would like to learn more about nitrogen sparging and how South-Tek may be of service, please contact us at 888-526-6284. 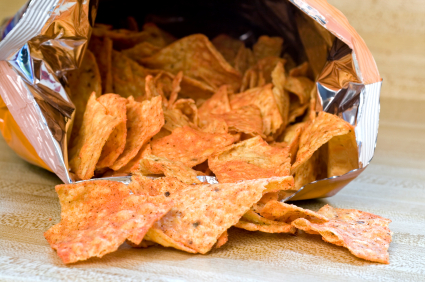 Modified Air Packaging, or "MAP," is a process in which food is packaged in such as way as to preserve taste, texture and freshness. MAP is primarily used in the food packaging industry; however, Modified Air Packaging can also be used in other areas such as the pharmaceutical industry. This common practice involves modifyinig the composition of the internal atmosphere of a package to create an enviroment best suited for that product's preservation. The process often begins with lowering the amount of oxygen and rebalancing the atmosphere with another gas. Oxygen can be a threat to perishable food, as its presence can allow the growth of aerobic ogranisms and bacteria, speed up oxidation reactions, and just generally threaten the overall freshness and quality of the product. However, there are some products that would actually spoil more quickly if oxygen was removed completely. For instance, in the case of fruit and vegetables, the absence of O2 can result in anaerobic respiration, with speeds up senescence (aging) and spoilage. In most cases, oxygen is used at low levels (between 3-5%) for best results. In addition to lowering the amount of oxygen, MAP also involves replacing the oxygen with another type of gas that will be more conducive to preservation. Nitrogen gas is a popular choice for MAP, as it is considered safe and economical. Using a Nitrogen Generator for the MAP process is the most efficient way to utilize N2 gas. Nitrogen Generators produce high purity N2 gas on demand by separaing the N2 molecules from the surrounding air we breathe. This allows the manufacturer to have a generator on site that can produce a steady supply of Nitrogen to be used whenever the need arises. This also eliminates the need for storing or handling high pressure N2 gas cylinders or relying on costly contracts from gas companies. If you'd like to know more about Nitrogen Generators and the many other industrial applications they can enhance, contact South-Tek Systems today. South-Tek Systems is a leading designer and manufacturer of Nitrogen Generators. What makes South-Tek stand out? Using their unique Flow Verification Program, clients of South-Tek Systems can be matched up with the most appropriate sized Nitrogen Generator for their needs, whether it's for MAP, laboratory atmosphere control, fire safety, or any other application where Nitrogen can be used, South-Tek likely has a machine that will suit your company's specific requirements. Call 888-526-6284 today to speak with a South-Tek representative, ask questions, and get a quote on your next N2 Generator. When corrosion becomes a problem in a fire protection system, it can be a challenge to determine the extent and severity of the damage. Because internal corrosion typically causes irreversible damage, fractional pipe replacement is almost always needed. In other words, a replacement of the affected pipe sections is usually required. Alternatively, a complete replacement of the entire pipe system may be required, or at least recommended. Depending on the extent of the corrosion and the scope of its affects throughout the system, a full replacement may make more sense. What is corrosion and how does it occur? Corrosion is a reaction that occurs when moisture and oxygen are present within the metal pipes. This is why using a supervisory gas such as Nitrogen can be highly beneficial in maintaining a fire protection system (FPS). Nitrogen is a safe, inert gas that has a very low dew point, meaning it is much less likely to liquify or freeze, which can cause damage to the system. How does corrosion damage FPS piping? Corrosion weakens the metal piping in an FPS in two key ways: both the accumulation of corrosion deposits, as well as the degradation of the pipe wall compromises the integrity of the system. Both issues have been proven to negatively impact the hydraulic characteristics of the sprinkler pipes as well as dramatically lower the effectiveness and safety of the system's performance overall. Where is corrosion most likely to occur? In most cases, the location of corrosion damage in both dry and preaction systems can be found in areas where trapped water has accumulated at improperly sloped sections. According to research and field experience conducted by CorrConsult, a corrosion and failure analysis company, corrosion damage is "...invariably confined to the larger diameter mains and cross-mains. These are oftentimes long pipe runs that were difficult to pitch properly at the time of installation." In wet sprinkler systems however, CorrConsult reports that corrosion is typically located at high points along the sprinkler piping where pockets of air have become trapped. Trapped air eventually rises and accumulates at the highest points, creating an environment where air and water are in almost constant contact. As already mentioned, the presence of air, water and metal within the same space is a recipe for the corrosive reaction to take place. Corrosion can lead to costly repairs, replacements and the threat of an improperly functioning system. To avoid corrosion, many facilities rely on Nitrogen for their supervisory gas. Nitrogen is a clean, inert gas that is much less likely to create an atmosphere where corrosion can take place. Due to its dry characteristics, it won't condense into moisture, nor will it freeze. Unlike using compressed air, which has a higher dew point, Nitrogen is far less likely to liquefy, seep into tiny pinholes or cracks, freeze again, and further exasperate a problem that started out as a minor issue. Nitrogen generation technology has made it much easier and cost-efficient for facilities to maintain their fire protection systems. South-Tek Systems is a leading designer and engineer of Nitrogen Generators, offering a line of products specifically suited for fire protection systems. The N2-Blast - Corrosion Inhibiting System is designed for dry and preaction fire protection systems, producing 98%+ pure Nitrogen and introducing it to the FPS. By doing so, oxygen and moisture are effectively displaced from the piping, inhibiting electrochemical, galvanic and microbiologically influenced corrosion (MIC), as well as freeze-ups and ice plugs. If you are interested in learning more about South-Tek's' products, please visit SouthTekSystems.com or call (888) 526-6284. For fire rescue organizations and their employees, smoke simulation is a key part of the overall training experience. In many cases, Nitrogen gas can be used to produce dense vapor that simulates smoke in a safe manner. This helps create a realistic training environment while protecting the trainees from the harm of real smoke produced from fire. Also, because Nitrogen is considered one of the safest gases due to its non-combustible qualities, it allows fire rescue groups to organize these training sessions without the risk of a real fire breaking out. South-Tek Systems is pleased to offer a special Nitrogen Generator designed specifically for this purpose. The SmokeBlast Nitorgen Generating System is for use in fire department training exercises and creates a supply of Nitrogen on demand. Because Nitrogen is a dominant gas in the air we breathe, the SmokeBlast can "pull" Nitrogen from the surrounding air and separate the molecules. The Nitrogen is then stored within the system until needed. The SmokeBlast Nitrogen Generating System creates Nitrogen at low pressure and a flow rate that is the same as high pressure Nitrogen cylinders for optimal smoke simulation. However, unlike the high pressure cylinders, the SmokeBlast creates Nitrogen with better safety, convenience, and reliability. And because it creates its own supply of Nitrogen gas, the user does not have to rely on expensive contracts with third party gas suppliers. To learn more about the SmokeBlast Nitrogen Generating System as well as other commercial and industrial uses for Nitrogen gas, talk to one of our experts at South-Tek Systems. Simply call (888) 526-6284 or reach out through our online contact form. Nitrogen Generators allow facilities that utilize Nitrogen to efficiently create their own supply of N2 gas on demand. This provides a level of cost effective, efficient N2 production that most clients find far superior to bulk liquid. While Nitrogen Generation can enhance operations in a variety of industrial and commercial applications, one industrial sector that highly benefits from N2 Generation is scientific laboratories. Labs often handle very sensitive and expensive material, so maintaining a clean, safe and non-contaminated environment is critical. Because laboratories require very specific atmospheric conditions, a Nitrogen Generator can allow the use of N2 gas in a safe, carefully controlled method. In a process known as atmosphere blanketing, oxygen is removed from the laboratory environment in order to create a non-combustible atmosphere. The use of Nitrogen in atmosphere blanketing is a safe and effective way to remove oxygen and its associated hazards. The challenge, however, is creating a steady supply of Nitrogen gas to maintain the proper flow rate and purity levels. The solution to this problem is installing a Nitrogen Generator at the point of process. More and more laboratories are turning to the simple, safe, and effective Nitrogen Generation Technology from South-Tek Systems. With a wide range of N2 Generator Systems in a variety of models, South-Tek can likely provide a system that will create the optimal atmosphere for your lab or clean room. Not only do our Nitrogen Generators provide a level of efficiency and safety, they can greatly reduce Nitrogen gas costs that are typically associated with relying on bulk liquid or expensive gas contracts. Switching from a gas supplier to a Nitrogen Generator allows laboratories to create a steady supply of Nitrogen as needed, saving time and money - which ultimately leads to a healthier bottom line for the company. To learn more about South-Tek Systems and our line of Nitrogen Generators, call toll free at 888-526-6284 or visit our website for specific details on our products and services. The N2 Series from South-Tek Systems includes five different Nitrogen Generation products that can help your facility create its own on-demand supply of high-purity Nitrogen gas. In this post we'll go over the products and give you the basic highlights of each. The N2-GEN Booster Series offers compact, high-pressure Nitrogen generation in three separate models. This series is designed for a multitude of applications and offers versatility in flow rates and Nitrogen purity to suit your specific needs. The three models include the N2-GEN-B3, N2-GEN-B4, and the N2-GEN-B6. All three models have the capability of generating high purity (98.5%) Nitrogen gas. They provide a max N2 pressure out of 2,400 PSIG and are offered in a uniform cabinet size of 26" x 32" x 33". Where the models vary is in N2 flow rate out and cabinet weight. The N2-GEN C Series, like the other N2-GEN series from South-Tek Systems, uses a Pressure Swing Absorption (PSA) designed system that is suited specifically for high purity N2 applications. This series includes eight different models, ranging from the low output, low weight STS N2-GEN 10C all the way up to the STS N2-GEN 150C. N2 outputs range from 100 SCFH to 1500 SCFH. Depending on your facility's N2 generation needs, space availability, and budget, you are likely to find a model that meets your requirements in the N2-GEN C Series. The N2-GEN Skid Mounted Series, or S series, is also available in eight different models that vary in N2 output, size and weight. Whether you can get by with the 100S model with 1,000 SCFH output or you need the bigger, more powerful 3000S model with 30,000 SCFH output, or one of the many options in between, South-Tek can help you find the model that works best for you. As the name implies, the Tank Mounted Series uses a PSA system for high purity N2 generation that can be mounted to the N2 tank itself. This series includes six models ranging in N2 output, size and weight. All models have the capability to produce 99.5% purity Nitrogen. The TL (Transmission Line) Series features an Arc Suppression System that inhibits corrosion and prevents voltage arcing in Transmission Lines. Moisture can accumulate in non-pressurized Transmission Lines compromising the integrity of your on-site equipment and end-product. The N2-GEN - Arc Suppression System produces 98%+ pure Nitrogen on demand to positively pressurize the Transmission Line. This series also includes the AutoPurge System and BlastOff Leak Detection System. The AutoPurge System controls positive pressure within the Transmission Line and maximizes the life of the overall N2 Generation System. The BlastOff Leak Detection System proactively detects significant leaks before they compromise the system. It has an internal audible alarm and dry contact for wiring into the Building Monitoring System (BMS). It will also alarm if the air compressor or N2-GEN is not working properly. Note that EVERY N2-GEN Nitrogen Generator comes equipped with a BlastOff Leak Detection System, so even if the TL series does not offer a product that meets your needs, you can rest assured that your system will be protected from significant leaks no matter what series/model you choose. How do I choose the right series/model? South-Tek Systems offers a MAP-IT System as well as a Performance Verification System for choosing the optimal model for any application and then monitoring its performance after installation. To learn more, contact South-Tek Systems today for a consultation. Our Nitrogen experts will be glad to discuss your facility's N2 needs and help point you in the right direction. Call us at 888-526-6284. As a business owner, facility supervisor, or plant manager, you understand the value of maintaining a safe and efficient workplace. You also understand the value of keeping a healthy bottom line. That's why, whenever your company is researching a new product or technology, the return on investment (ROI) is one of the first things you consider. When it comes to Nitrogen Generators from South-Tek Systems, you may be surprised at how quickly your company will gain its return on the initial investment. If you're still relying on expensive N2 gas contracts from third party companies, or if you're ordering bulk liquid Nitrogen, you know how costly, inefficient, and often unreliable these methods can be. But is switching to an Nitrogen Generator installed at your facility really worth the initial expense? But we don't expect you to simply take our word for it. Research has shown that the average ROI when switching from bulk liquid Nitrogen to producing your own N2 gas on-site is 12-14 months. 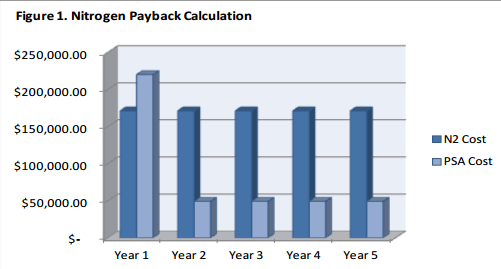 This means that, in as little as one year, you could be seeing a payback on your investment. And the savings doesn't end after the initial expense has been "paid off." The continued use of a Nitrogen Generator means continued savings on operational costs, delivery costs, and more. Just think about all the costs (both in terms of finances and time) associated with handling bulk liquid Nitrogen or gas company contracts. In addition to dealing with the delivery, handling and storage, there are also administrative, safety and efficiency tasks. With a Nitrogen Generator, much of the time and money devoted to these issues is eliminated (See: Valuable ROI with a Nitrogen Generator). Efficiency is a major concern for most businesses - and it is one of our biggest selling points for our Nitrogen Generator equipment. After installing a Nitrogen Generator, your facility will have access to high-purity Nitrogen gas as needed, at the flow level required. No excess, no shortage. You can also take advantage of the South-Tek Systems MAP-IT Flow and Purity Verification System, which identifies the exact flow rate and purity level required for your application. Having this level of control allows for a much more efficient method of utilizing N2 gas. The Nitrogen Generators from South-Tek Systems rely on the surrounding air to produce Nitrogen. Because Nitrogen is already present in much of the air we breathe, the supply is literally endless. However, our systems don't need to run non-stop; production will only begin when a demand downstream is sensed - meaning your system will only create the Nitrogen you need, when you need it. This efficient, high-tech sensory capability means the machine will need little to no oversight to function properly. This allows engineers, site managers and other workers to focus on more important tasks. Contact the experts at South-Tek Systems today to learn more about your ROI with one of our Nitrogen Generators. We have a variety of models to accommodate the needs of any size facility within a wide variety of industries. Call us today at 888-526-6284 or contact us online. Did you know that Nitrogen gas makes up about 75 percent of the air we breathe? Because Nitrogen is so present in our atmosphere, it's no surprise that more and more industries are relying on it for use with applications at their facilities. And, as such a common resource, it's also not surprising that more facilities are choosing to use installed Nitrogen Generators for their N2 gas needs. Power plants especially benefit from using Nitrogen Generators, as they consistently rely on Nitrogen gas for a multitude of applications (See: Nitrogen for Power Plants). 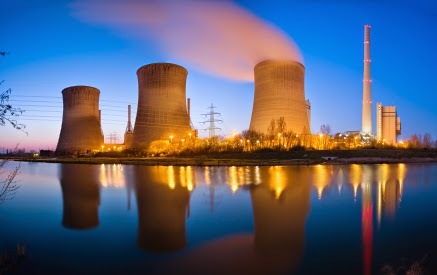 From inerting boiler tubes and condensers to preventing corrosion within fire protection systems to evacuating natural gas and more, Nitrogen is commonly and safely used in power plants throughout the world. Because Nitrogen is a dry, inert gas - meaning it is highly unlikely for it to create moisture or combustion - power plants that utilize it for their operations can rest assured that they are harnessing a resource that has been proven safe and reliable. This not only protects the workers within the plant, but it also maintains a level of safety and integrity for the industrial components and for the facility and itself. As a leading manufacturer of Nitrogen Generators, South-Tek Systems is pleased to offer a variety of N2 Generation Systems that are ideally suited to power plant facilities. Whether your facility could use a Nitrogen Generator for gas turbine Nitrogen purging, or you would like to protect your plant's wetted parts from corrosion during outages, a Nitrogen Generator from South-Tek Systems can greatly benefit your facility. Best of all, by installing a Nitrogen Generator, your plant eliminates the need for expensive contracts with third party gas companies. This can offer the company a healthier bottom line and a much more satisfying return on investment. In addition, you can rest assured that South-Tek Systems will install the ideal model for your application by implementing their Flow Verification Program. We will also monitor the system's performance through our unique Performance Verification System. For more details on South-Tek Systems and how a Nitrogen Generator can improve your power plant's operations, please call toll free at (888) 526-6284 or contact us through our website. Our Nitrogen Generation experts are here to answer your questions! You might think using Nitrogen to preserve food is a little...nutty. But many food manufacturers rely on this clean, inert gas to package, preserve, and store perishable food items. Over the years, more and more food industries have begun relying on Nitrogen Generation Systems for their N2 gas needs. Why Use Nitrogen Gas for Nut Packaging? Nuts in particular are very often packaged with Nitrogen to prevent unwanted issues like oxidation and package collapse. Oxidation occurs when oxygen reacts with other elements to alter the product (which could result in spoiling, or a less-than-desirable taste, at the very least). And packaging collapse, well...it's exactly what it sounds like. And in case you didn't already know, proper packaging is not only essential to protecting the product from damage, it also plays a key role in marketing and selling the product. How a product is packaged can affect how attracted the consumer is to the item. This doesn't just apply to color schemes and labeling - it can apply to the package's overall shape, and whether or not the container looks "full." In addition to using Nitrogen for food packaging, it can also be used to help remove oxygen, which allows for a longer shelf life. Specific packaging applications also include bulk packaging, consumer packaging, vacuum packs, fumigation purge and many more. When you buy nuts from the grocery store (stored, not fresh), it's very likely that Nitrogen was used at some point in the packaging process. If Nitrogen had not been used, you would quickly know it, because the nuts would probably be spoiled, tasteless, or have an odd texture and/or tint. So how do these facilities access the Nitrogen gas they need to properly package and preserve their products? While some facilities choose to buy Nitrogen from gas companies, others are going the more efficient route by installing a Nitrogen Generator at the facility at the point of process. Unlike being tied down to expensive contracts with gas companies, which usually deliver N2 gas in high-pressure cylinders, installing an on-site Nitrogen Generator allows you to actually pull Nitrogen, on demand, from the air we breathe. This means no accidental run-out during peak manufacturing times, no more need to store cumbersome cylinders, and no more expensive long term commitments to gas companies. Best of all, facilities that switch to a Nitrogen Generator can have a ROI of up to 90% over bulk liquid Nitrogen. And hey, who doesn't like a healthy bottom line? South-Tek Systems is a leading manufacturer of Nitrogen Generators, many of which can be safely and effeciently installed in food manufacturing and food packaging facilities. To learn more, call toll-free (888) 526-6284. The practice of soldering - joining two or more metal items by melting and adhering a filler metal - is used in a wide variety of applications. 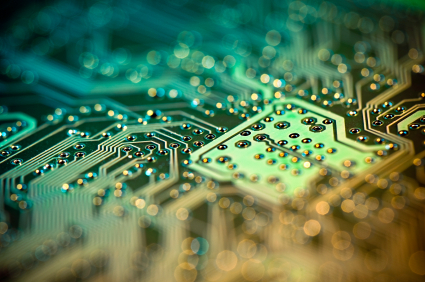 From plumbing to jewelry making to electronics manufacturing, soldering is a common practice. Unfortunately, the process of soldering can be hindered by the presence of oxygen. Oxygen and metals don't interact well together, especially if there's any threat of moisture in the environment that would spark the corrosion reaction, so soldering can be less effective when done in an oxygen-rich environment. The solution to this problem is applying Nitrogen - a safe, dry and non-combustible gas - to effectively displace oxygen, creating an environment that is much more conducive to soldering. 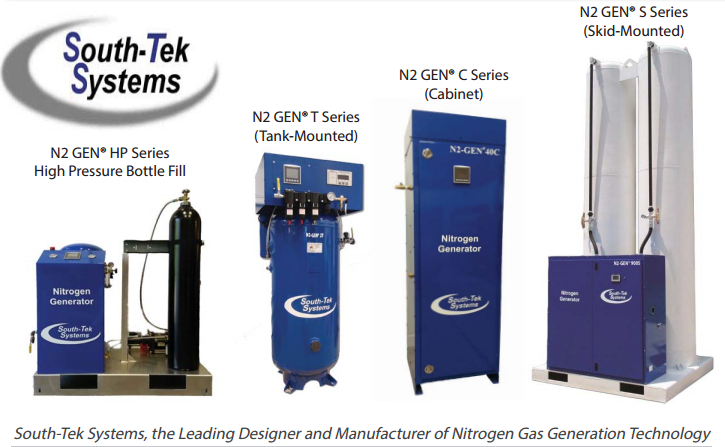 Nitrogen Generation specialists at South-Tek Systems have created an impressive line of Nitrogen Generators that can be used specifically for the purpose of soldering with Nitrogen gas. The N2-GEN Series Nitrogen Generators are designed for industrial applications such as soldering. The technology used is simple and straightforward: the generator essentially pulls the Nitrogen molecules from the air we breathe and collects them for storage until ready for use. Because the N2-GEN systems generate their own supply of high-purity Nitrogen on demand, there's no need for expensive contracts with third party gas companies, nor is there a need to handle and store those cumbersome, high-pressure cylinders. Imagine being able to manage your most sensitive soldering projects without having to worry about running out of Nitrogen. With the Nitrogen Generators from South-Tek Systems, your on-site Nitrogen needs can be fulfilled conveniently and at a cost that can help your company maintain a healthy bottom line. Call South-Tek Systems' toll free number for details and to learn more about how Nitrogen Generation technology can benefit your company: 888.526.6284. Nitrogen is a clean, dry, inert gas that helps reduce or eliminate the presence of oxygen and moisture within an atmosphere. This is highly beneficial in the manufacturing industry, especially when it comes to manufacturing sensitive or fragile technical equipment. Radio telescope manufacturers, for instance, rely on the presence of high-purity Nitrogen gas to displace oxygen that causes moisture. Any sign of moisture in this type of atmosphere can cause harmful corrosive reactions to the sensitive transducers. The challenge presented to most manufacturers is how and where to get Nitrogen - and how to keep it cost effective. Some manufacturing facilities rely on Nitrogen cylinders that are brought in from third party gas companies. But more and more facilities are choosing the safer, more efficient, cost-saving option of installing a Nitrogen Generator directly on the premises. South-Tek Systems is a worldwide leading designer and manufacturer of Nitrogen Generating Equipment. Their N2-GEN Series Nitrogen Generators are designed specifically for industrial applications at manufacturing, power generation, and lab facilities. With one of South-Tek's Nitrogen Generators, your facility can have access to high-purity Nitrogen at any time, day or night, and it will never run out. That's because Nitrogen Generators from South-Tek pull Nitrogen molecules from the surrounding air we breathe and store them until they're needed for your facility's application. These generators are highly self-sufficient, making it easy for facility managers to go about their daily operations without having to worry about the lab's Nitrogen supply. And, if there's ever a problem, customer support is never far away. Read more about the benefits of an N2-GEN Nitrogen Generator for Radio Telescope Manufacturing. Using state-of-the-art technology, South-Tek's Nitrogen Generators are safe, efficient, and they come in a variety of sizes and models to suit just about any facility's needs. Learn more at www.southteksystems.com or call our toll-free number at 888.526.6284. Nitrogen gas is one of the most common elements in the universe. It is estimated to be seventh in total abundance in our galaxy and solar system, and forms approximately 80 percent of the Earth's atmosphere. Because it is so common, and because of its favorable qualities, Nitrogen is used for a variety of tasks and is relied upon for a variety of applications. One such application is laboratory research. When it comes to creating an atmosphere that is safe, dry, clean and conducive to scientific research, Nitrogen is by far the most effective choice. And because many leading universities serve as starting points for advanced research and laboratory testing, it's no wonder so many of them rely on high-purity Nitrogen gas for their experiments and technical operations. From controlling the atmosphere in order to protect highly sensitive equipment, to sample preparation for chemical analysis, Nitrogen plays a key role in the research lab setting. Because universities and research labs often require large amounts of Nitrogen to maintain their operations and atmosphere, a Nitrogen Generator is typically used to reduce the risk of accidental run out. Nitrogen Generators are advanced systems that create their own steady supply of Nitrogen gas by separating the N2 molecules from the surrounding air and storing it in a tank for future use. Nitrogen was first discovered to be a separable component of air in 1772 by Scottish physician Daniel Rutherford. Since then, people have been able to effectively separate Nitrogen molecules from the surrounding air we breathe and apply it to various operations. Although the process sounds highly technical and complicated, Nitrogen Generators can accomplish the task safely, efficiently, and with minimal supervision. Most Nitrogen Generators are fully automated, which means they will begin producing Nitrogen as soon as the sensors pick up a demand downstream. Once the sensors on the Nitrogen Generator activate, the generator will automatically begin the process, using either PSA or Membrane Technology. This can be a much safer, more reliable source for Nitrogen than liquid Nitrogen tanks, or high-pressure cylinders. Using a Nitrogen Generator can also be a more cost-effective solution for laboratories and university research teams. 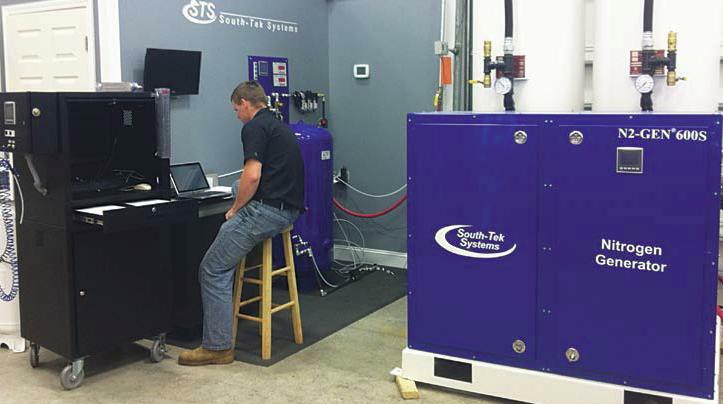 South-Tek Systems, a leading manufacturer of Nitrogen Generation Systems, has conducted research to estimate the total savings that can be actualized by switching to an on-site Nitrogen Generator. The results indicate that by using a Nitrogen Generator, which produces high-purity Nitrogen gas on demand, a facility's overall Nitrogen costs can be reduced by up to 90 percent! Return on investment averages 12-14 months after installation, over bulk liquid Nitrogen. 20 year life expectancy for the system. No missed deliveries, rising gas costs, or expensive contracts to sign. To learn more about Nitrogen generation technology and how it can benefit your research lab or university, contact the Nitrogen experts at South-Tek Systems. Call 888.526.6284 or contact us online for more information. Nitrogen gas has a wide range of uses within various industrial applications. One such application is the processing, curing and treating of resins. Resins are used in many different materials, some of which are even used in the aerospace industry, and need to be carefully cured in order to prevent bubbles, deformities and impurities. Nitrogen can be introduced in the treatment process to ensure that autoclaves, ovens and aluminum furnaces can process the product safely and efficiently. In a process known as purging, nitrogen is introduced to displace existing oxygen, moisture or contaminants. In autoclaves, which process industrial parts and equipment, nitrogen is used in place of compressed air to greatly reduce the risk of combustion. Because nitrogen is an inert gas, it is an effective choice for maintaining safe operating procedures. Also, because nitrogen is readily available, it can be a cost-effective solution for facilities that rely on furnaces, ovens and autoclaves for large-scale production. To further benefit from nitrogen's efficient and safe use, a Nitrogen Generator can be installed at the point of process to effectively generate a supply of N2 gas from the surrounding air. South-Tek Systems is a leading manufacturer of such generators and our sole focus is dedicated to safe, reliable nitrogen generation technology. We are specialists in the N2 generation field, providing a wide range of Nitrogen Generators in various sizes to better serve a multitude of facilities. The Nitrogen Generators from South-Tek System use the latest technology to separate nitrogen molecules from the air we breathe, which frees the user or facility manager from having to rely on expensive high-pressure gas cylinders, which can run out unexpectedly - not to mention require a costly contract with gas suppliers. Instead of having to change out nitrogen gas cylinders, having a Nitrogen Generator at the point of process can help your facility run smoothly, with less risk of interrupts and down-time during peak production. To learn more about South-Tek Systems and how our Nitrogen Generators can benefit your autoclave purging operations, please give us a call at 888-526-6284 or contact us online for more information.